In the second season of the WFN Original, Lost Lake, which premieres on WFN: World Fishing Network on Monday, January 31, at 9:00 pm ET, the world's top anglers demonstrate one of the many talents that make them great - the ability to break down unfamiliar and unchartered territory quickly and catch fish. "The average angler will appreciate the talent these pro's have for figuring out how to catch fish anywhere," said Corey Russell, Vice President of Production for WFN: World Fishing Network. 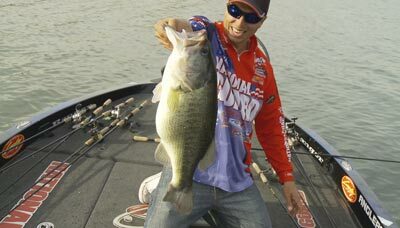 "Lost Lake strips away all of the preparation they do before a tournament and puts them to the test with cameras rolling and the pressure on." Each week for 10 episodes, Lost Lake will take a professional angler onto the water and put them to the test. For a complete schedule, visit WorldFishingNetwork.com. Here's a look at the first four episodes and the anglers who took the challenge. Episode #1 (Jan 31) -- "Obvious Cover" - Dave Wolak heads to a Lost Lake in northwestern New York and tries to dissect a lake with heavy vegetation and windy conditions during high pressure conditions. Episode #2 (Feb 7) - "Pump Back Lake" - Edwin Evers breaks down a Lost Lake in southern Oklahoma with significant current and water fluctuation by mastering his electronics. Episode #3 (Feb 14) - "Boarder Lake" - Clark Reehm heads to a Lost Lake in the deep south of Louisiana where flipping endless rows of cypress trees and vegetation is a predominant pattern. Episode #4 (Feb 21) -Dock Fishing" - Marty Stone breaks down a Lost Lake in North Carolina during the heat of summer fishing his favorite technique...flipping boat docks. From Monday-Saturday, WFN theme nights present a two-hour block of themed programming dedicated to all aspects of the pastime, airing nightly, 8:00 pm -10:00 pm. ET. The six "WFN Theme Nights" are: Big Bass Monday; Fly Fishing Tuesday; Offshore Saltwater Wednesday; Inshore Saltwater Thursday; Freshwater Friday; and World Fishing Saturday. Featuring popular programs hosted by the world's top anglers, the Network also delivers a weekly news program, WFN News, and the schedule includes a variety of exclusive lifestyle shows including; Hookin' Up with Mariko Izumi, Reel Fishy Jobs with Mark Melnyk, Lost Lake and Getting School'd with JP DeRose. The beauty of WFN's programming is available in 100 percent stunning High Definition. WFN's multimedia platform includes a mobile portal, WFN Fishing Log (fishing app for the iPhone and iPad) and a robust fishing website. Originally launched in December 2005, today WFN and WFN HD are available in more than 20 million households through North American cable, satellite and telecommunications distributors including: Dish Network, Comcast, Charter, AT&T U-Verse and more. For more information, visit WorldFishingNetwork.com.